What do I miss the most about working in a bookstore? Besides the fact that I was surrounded by books all day long, I would have to say that I most miss browsing books when business got really, really slow. I was able to build up quite a wish list while working there — and I fully utilized my employee discount on a weekly basis. 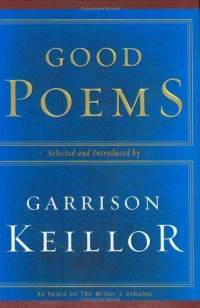 One of the books that I acquired while working at Waldenbooks was Good Poems by Garrison Keillor. At the time, I just really wanted to find NEW poets to sink my teeth into. The title of this book is spot on, as well. All of the poems (and poets) featured between its covers are exceptional. Each page exposes you to a special piece of art. I am especially fond of the dedication page – To all the English teachers, especially the great ones. While I value all of the teachers that taught me over the years (well, okay, MOST of them), all of my English teachers (well, okay, MOST of them) will forever hold a special place in my heart. When I did bond with a teacher, it was always an English teacher, and I credit them for exposing me to great literature and for always encouraging me in my writing. Buy these good poems (and many more) on Amazon.